Erik and I ate at ABC Kitchen right before Christmas and had an amazing crostini with squash, apple cider vinegar, and ricotta that we just had to try to make at home. Even if this isn’t exactly like ABC’s version, it’s still delicious! It was the perfect light dinner before heading out for New Year’s Eve. When I experimented with this at my parents’ in Minnesota, I used drained cottage cheese instead of the ricotta. 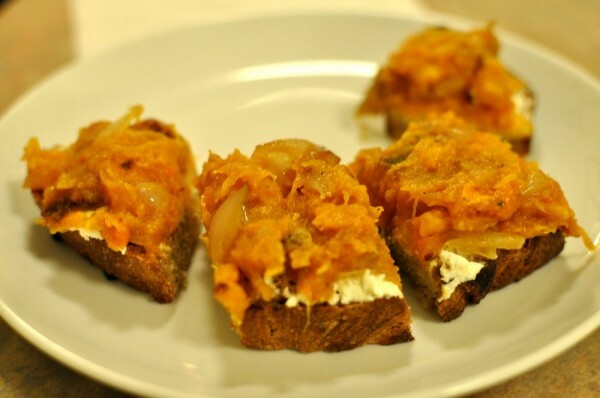 You could use any mild, spreadable cheese. You could also use pumpkin or another squash instead of the butternut. 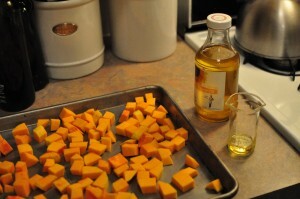 Peel, seed, and chop the butternut squash into 1/2 to 1 inch cubes (see this post for directions). 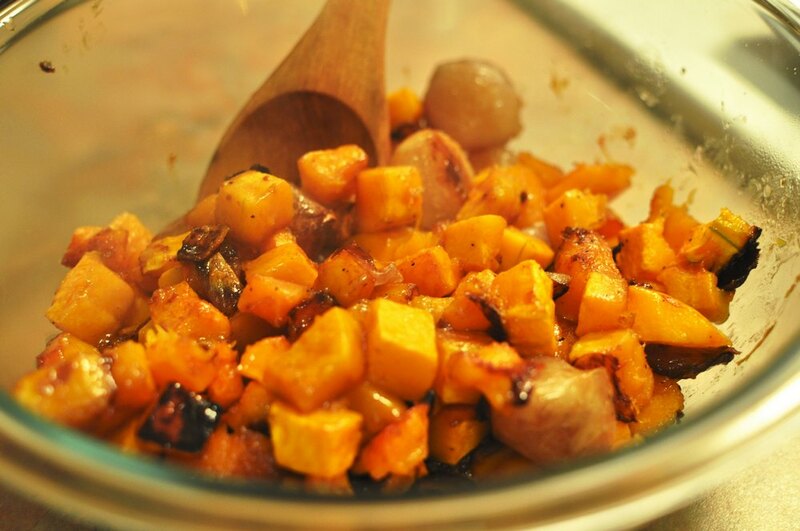 Put the butternut squash cubes in a rimmed sheet pan and toss them in 1 tablespoon of the sunflower oil and a good sprinkling of salt and pepper. Roast in the oven at 375 degrees. Set a timer for 45 minutes and begin on the next steps. 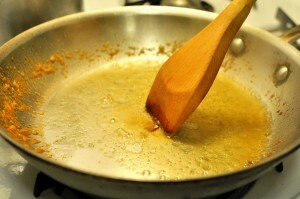 Melt the butter and the remaining 1 tablespoon of sunflower oil over medium heat in a non-non-stick skillet. To repeat, you do not want to use a non-stick skillet. You want bits to stick to the bottom for flavor. 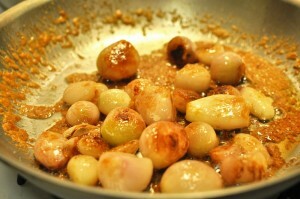 Once the butter has melted, add the peeled shallots and the sugar to the skillet. 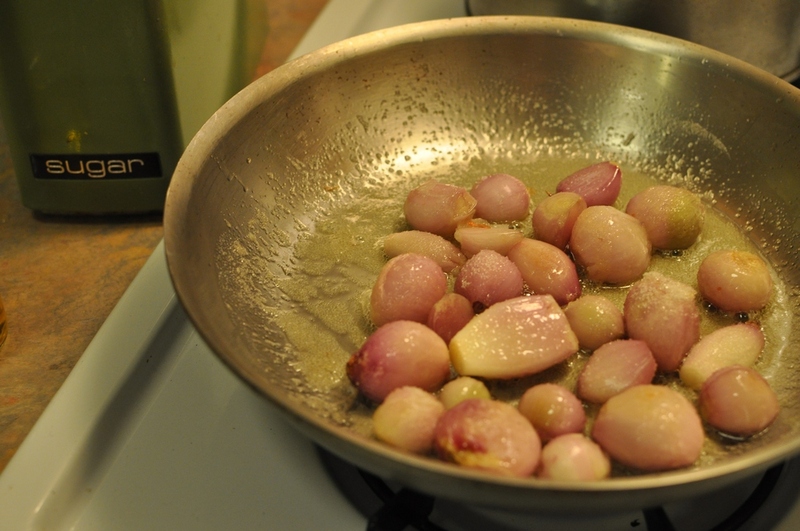 Saute for about 10 minutes until the shallots are light brown. 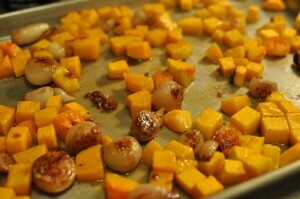 Pull the butternut squash out of the oven (they won’t be done yet – leave the clock ticking) and scrape the shallots and oil/butter into the sheet pan. Set the sheet pan aside for a moment (be sure to use a trivet!). Add the apple cider vinegar to the skillet. Heat it to boiling while scraping the bottom of the pan to get all the tasty bits. (This is called deglazing.) 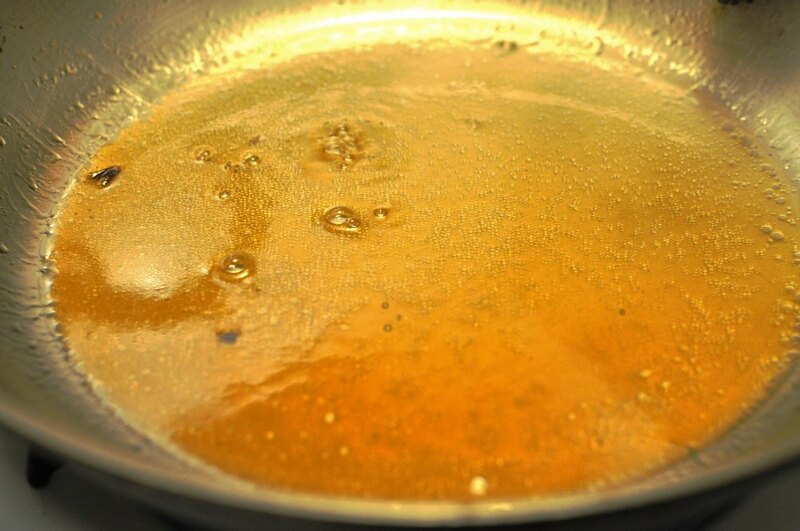 The vinegar should be darker now. Pour it from the skillet into the sheet pan and toss everything together. Put the sheet pan (which now contains everything) back into the oven and continue to roast for the remainder of the 45 minute time until the squash is really soft. If it’s not done after the initial 45 minutes, keep it in the oven but check on it every 10 minutes until done. 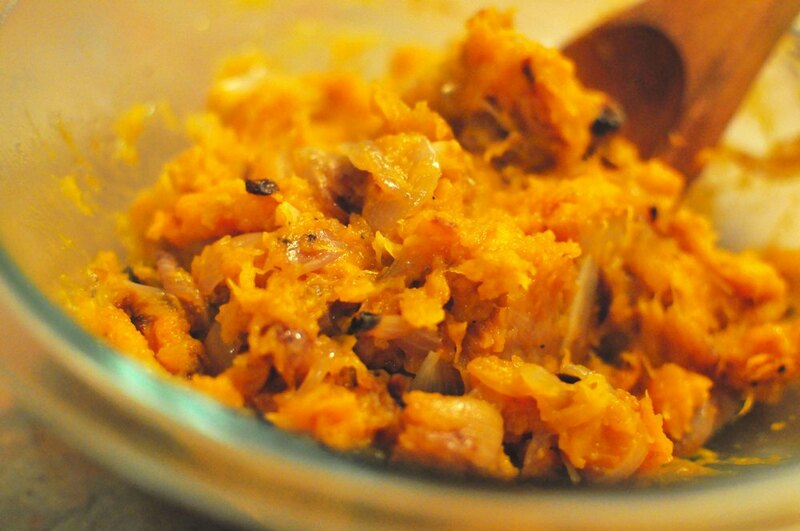 Once the squash is done, transfer everything to a heat-resistant bowl (i.e., not plastic). 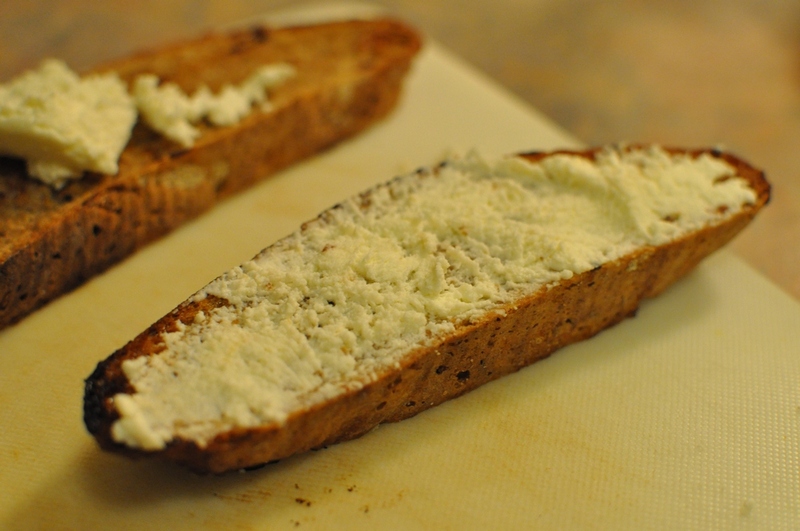 Take the ricotta out of the fridge so that it can warm to room temperature. Lightly butter one side of each piece of bread. Place all of the slices on the sheet pan butter side up (don’t bother to clean the pan). You don’t need to butter the bottom side because the sheet pan is already oily from the squash. Move the oven rack to the top of the oven (be careful!). Toast the bread for 5 minutes on each side in your 375 degree oven. While the bread is toasting, squish the squash mixture with a fork, pastry blender, or potato masher. Leave a few lumps in for texture. The shallots will break up, but won’t completely disappear. Once the bread is toasted, spread each piece with a thin layer of ricotta and a thick layer of the squash mixture. 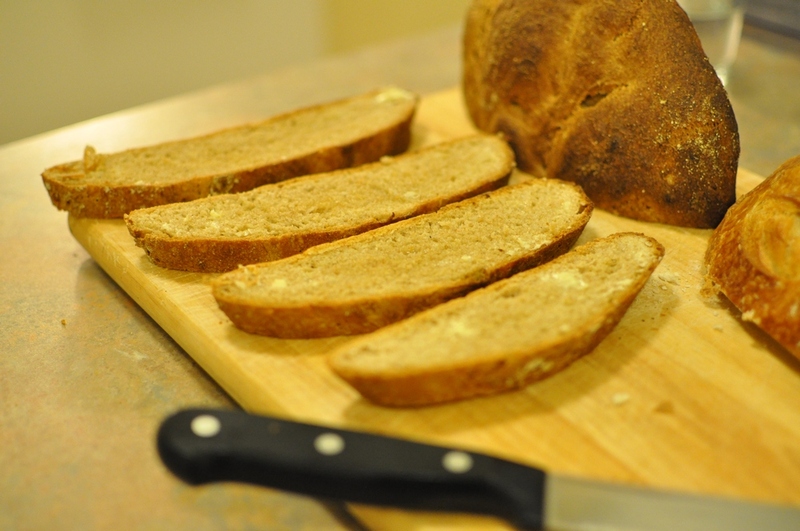 Cut each piece into 3 or 4 strips (for easy biting) and dig in. Happy New Year, everyone! I hope 2011 is exciting and joyful for you all!